In his Recipes Project post, Arnold Hunt focused on the recipe books owned by Sir Hans Sloane. The Sloane family may have had an illustrious physician and collector in their midst, but they, too, collected medical recipes like many other eighteenth-century families. As Alun Withey points out, medical knowledge was of part of social currency. Three Sloane-related recipe books that I’ve located so far provide insight into some of the family’s domestic medical practices and interests. Two books are held at the British Library, donated in 1875 by the Earl of Cadogan. A book of household recipes, primarily for cookery, was owned by Elizabeth Sloane—Sloane’s daughter who married into the Cadogan family in 1717 (BL Add. MS 29739). The second book, c. 1750, contained medical, household and veterinary recipes (BL Add. MS 29740), including several attributed to Sir Hans Sloane. 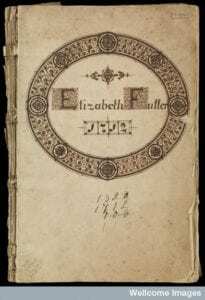 A third book, which belonged to Elizabeth Fuller, is held at the Wellcome Library (MS 2450) and is dated 1712 and 1820. Given the initial date and name, it is likely that the book’s first owner was Sloane’s step-daughter from Jamaica, Elizabeth Rose, who married John Fuller in 1703. Sloane’s nephew, William, married into the Fuller family as well in 1733. Elizabeth Sloane, of course, compiled her collection long before her marriage; born in 1695, she was sixteen when she signed and dated the book on October 15, 1711. This was a common practice for young women who were learning useful housewifery skills. The handwriting in the book is particularly good, with lots of blank space left for new recipes, suggesting that this was a good copy book rather than one for testing recipes. There are, even so, some indications of use: a black ‘x’ beside recipes such as “to candy cowslips or flowers or greens” (f. 59), “for burnt almonds” (f. 57v) or “ice cream” (f. 56). The ‘x’ was a positive sign, as compilers tended to cross out recipes deemed useless. The Cadogan family’s book of medicinal remedies appears to have been intended as a good copy, but became a working copy. In particular, the recipes to Sloane are written in the clearest hand in the text and appear to have been written first. Although there are several blank folios, there are also multiple hands, suggesting long term use. There are no textual indications of use, but several recipes on paper have been inserted into the text: useful enough to try, but not proven sufficiently to write in the book. As Elaine Leong argues, recipes were often circulated on bits of paper and stuck into recipe books for later, but entering a recipe into the family book solidified its importance—and that of the recipe donor—to the family. Sloane’s recipes are the focal point of the Cadogan medical collection. Many of his remedies are homely, intended for a family’s everyday problems: shortness of breath, itch, jaundice, chin-cough, loose bowels, measles and worms. There are, however, two that spoke to his well-known expertise: a decoction of the [peruvian] bark (f. 8v)—something he often prescribed–and “directions for ye management of patients in the small-pox” (f. 10v). Elizabeth Fuller compiled her book of medicinal and cookery recipes several years after her marriage and the book continued to be used by the family well into the nineteenth century. The book is written mostly in one hand, but there are several later additions, comments and changes in other hands. The recipes are idiosyncractic and reflect the family’s particular interests: occasionally surprising ailments (such as leprosy) and a disproportionate number of remedies for stomach problems (flux, biliousness, and bowels). The family’s Jamaican connections also emerge with, for example, a West Indies remedy for gripes in horses (f. 23). There are no remedies included from Sloane, but several from other physicians. This group of recipe books connected to the Sloane Family all show indications of use and, in particular, the Cadogan medical recipe collection and the Fuller book suggest that they were used by the family over a long period of time. Not surprisingly, the Fuller family drew some of their knowledge from their social and intellectual networks abroad. But it is the presence or absence of Sloane’s remedies in the books that is most intriguing. Did this reflect a distant relationship between Sloane and his step-daughter? Hard to say, but it’s worth noting that his other step-daughter, Anne Isted, consulted him for medical problems and the Fuller family wrote to him about curiosities. Or, perhaps, it highlights the emotional significance of collecting recipes discussed by Montserrat Cabré. Sloane was ninety-years old when the Cadogan family compiled their medical collection. 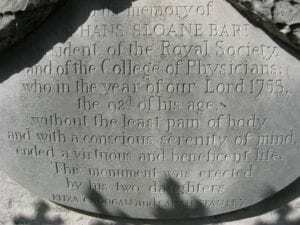 Hans Sloane Memorial Inscription, Chelsea, London. Credit: Alethe, Wikimedia Commons, 2009. It must have been a bittersweet moment as Elizabeth Cadogan (presumably) selected what recipes would help her family to remember her father after he died: not just his most treasured and useful remedies, but ones that evoked memories of family illnesses and recoveries.